Entertainment systems change. Technology changes. Music and video sources change. If you still have the same factory-installed head unit�and can't replace it because it's integrated into the vehicle's electronics�how can you upgrade your system? VehicleHub™ Pro has the perfect solution. You can keep your current head unit,yet add all the media sources you want, build up your sound�even to 5.1-channel�and enjoy convenient central control with our new ORB controller. It's a definite change for the better. VehicleHub™ is a versatile Ai-NET™ controller unit that provides an on-screen display when used together with a factory-installed video display unit. 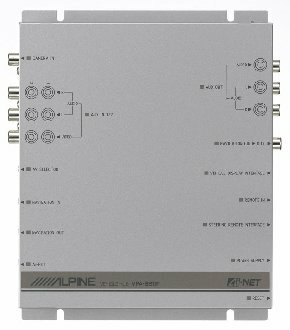 It makes it easy to incorporate Alpine Ai-NET™ components, video players and navigation systems into the original system. If you have a factory-installed system, but want to take advantage of all the exciting new media and entertainment possibilities available now, Alpine has the answer. VehicleHub™ is a one-box solution that lets you add Alpine components to your system�and upgrade to your heart's content. Want to listen to your iPod in the car? Need a navigation system to map out your drive? Time to upgrade your old system and revitalise it with the latest media. Install VehicleHub™, and you're on your way to building a dream info/entertainment system. Add our VPE-S431 Video Expansion Module and get three additional video sources�all independently selectable from the rear seat! Your passengers can make their selections, and listen from the speakers or privately on headphones. This product was added to our catalog on Monday 02 March, 2009.